Sunderland have signed former Hull City striker Dame N'Doye from Trabzonspor on loan until the end of the season. The 30-year-old joined Hull last February and scored five times before moving to Turkey in the summer. The Senegal international is awaiting a work permit and will not be available for Saturday's trip to Tottenham. Manager Sam Allardyce said: "Having already played in the Premier League he should have no problems in hitting the ground running." 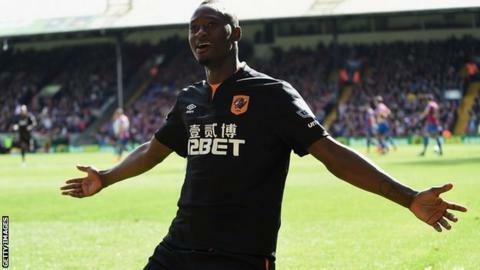 N'Doye was a deadline day signing for Hull 12 months ago and scored goals in wins over QPR, Aston Villa and Crystal Palace - but could not prevent the Tigers from going down. He has not scored in 12 appearances since moving to Turkey. N'Doye, who will wear the number 10 shirt, is Sunderland's second signing of the January transfer window, after the arrival of central defender Jan Kirchhoff from Bayern Munich. Sunderland have won their last two league games and are third from bottom in the Premier League, one point off 17th-placed Swansea.